What Is the Difference Between Shortening & Vegetable Oil in Doughnut Making? Doughnuts are not the healthiest of snacks, by any measure. They start with a rich, sweet, dough, then they're deep-fried, and finally they're tossed in sugar, filled with jam or topped with a sugary glaze. 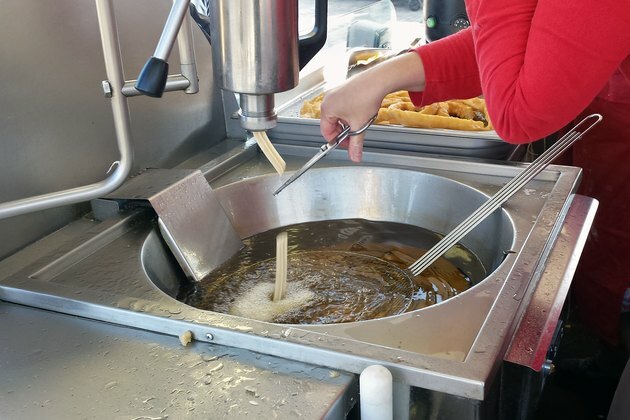 While there are ways to make the doughnuts themselves healthier, deep-frying remains problematic; shortenings and vegetable oils both have shortcomings. Commercial doughnut production makes several demands on the finished product. Doughnuts intended for retail sale at supermarkets must hold their freshness, texture and appetizing appearance for as long as two weeks. Doughnuts sold at doughnut shops don't have the same requirement for shelf life, but they must retain their attractive appearance and be soft in texture, golden in color and sweetly neutral in flavor. The choice of a frying fat affects these desirable characteristics sharply. Because of their molecular structure, saturated fats are solid at room temperature and unsaturated fats are liquid. Most fats contain a mixture of the two, and chicken fat is softer than beef fat because it's less saturated. Foods fried in a saturated fat don't feel oily in your mouth because their fats are in solid form. Foods fried in oils absorb more of the fat, which remains in liquid form and is perceived as oiliness or greasiness. Shortening, made by hydrogenating vegetable oil to make it act like a solid, saturated fat, is the frying fat of choice for the doughnut industry. The hydrogenation process makes shortening a stable frying fat. Every fat breaks down as it absorbs impurities from the food, but hydrogenated fats are slow to do so. This makes them longer-lasting and, therefore, more cost-effective. Hydrogenated shortening produces doughnuts with a consistent color and flavor, and because it lasts longer, it's more cost-effective and profitable. The problem with shortening is that the hydrogenation process, besides solidifying the fat, creates trans-fatty acids. These trans fats are known to have adverse effects on heart health, just as saturated fats do. Vegetable oil isn't an option for commercial doughnut makers, because it makes the doughnuts oily and prevents glazes from sticking. Shortening gives a superior product, but the presence of trans fats means it can't be used in some jurisdictions. Trans fat-free shortenings are available, based on palm oil or other tropical oils, but these are high in saturated fats and, therefore, also undesirable. At home, doughnuts fried in vegetable oil are passable because they're likely to be eaten right away, before the oil seeps into the sugar coating. Conventional or non-hydrogenated shortening will give a better result, but neither is as healthy.